Ancient Olive Trees – Search Marketing, SEO and Display Ads | ASTRALCOM - Content Strategy, Conversion Marketing and Customer Acquisition. 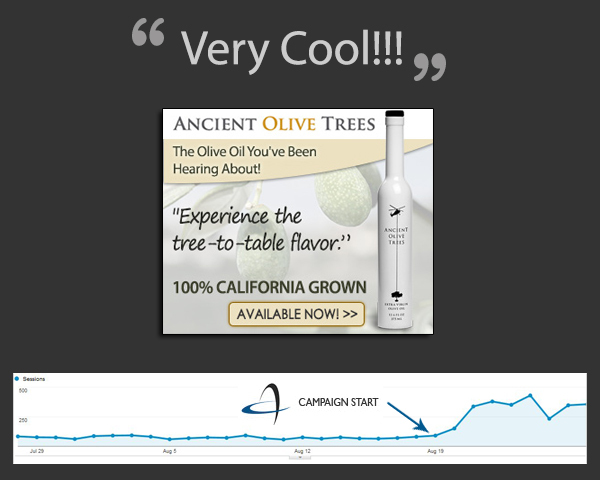 Ancient Olive Trees – Search Marketing, SEO and Display Ads | ASTRALCOM – Content Strategy, Conversion Marketing and Customer Acquisition. Ancient olive trees wanted to hit the market strong and cover a wide region of targeted consumers. So, we put them on adZooks! to cover the display channel and we began an aggressive paid keyword search campaign, topped-off with a best-practices organic search effort. Results after 10 just days? Nearly 1 million ad views and more than 3,500 targeted customers to the website. Want to increase your brand awareness among your customers and drive targeted traffic to your site? Just contact us today and we’ll be happy to explore ideas with you.